The 2013 NBA Draft will be held at the Barclays Center in Brooklyn tonight. Unlike last year’s draft, there’s no consensus No.1 overall pick this June. Round-ball prognosticators have described this class of NBA hopefuls as very deep, but lacking any true star power at the top. And many experts have stated that this draft has been the hardest to predict in recent memory. So the league’s 30 GM’s must navigate a particularly turbulent sea of unknowns to determine the right fits for their franchises and how to maximize value when they cash in their chips. Who will go #1? Will there be more than the usual amount of trade activity and position switching among the lottery teams? Will teams go for best available player or focus on filling positional needs? Will established playoff squads flip a veteran starter for a pick in order to avoid the more punitive luxury tax that kicks in next season? Though it’s anyone’s guess which uniforms this crop of future NBA stars will be wearing at the end of the night, here’s a breakdown of 10 players who will most likely will be selected in the top half of the first round. Nerlens Noel: Noel played in only 24 games for Coach Calipari at Kentucky this season due to a torn ACL. The 6’10” freshman center has A+ physical attributes and a huge upside. With a 7’4” wingspan he averaged 4.4 bpg at KU. Noel can rebound and defend vertically and horizontally. However, he weighed in at 206 pounds recently and that combined with his ACL issue may scare off some teams. If he doesn’t go #1 overall to the Cavs, Noel won’t fall more than a few slots. Alex Len: The 7’1” Ukrainian performed well in his sophomore season at Maryland. He added weight to his sturdy frame which helped compliment his overall production. Len can score, board and block shots. He possesses soft hands and a good touch around the rim. When asked to guard an opposing big or to protect the rim, Len’s 7’4” wingspan allows him to alter shots and change the dynamic in the paint. He has a chance to go to Cleveland with the top pick. Otto Porter: The 6’8” Georgetown sophomore may be the most polished, NBA-ready player in the draft. Porter has the full package of size, smarts, perimeter shooting and defense. He often served as a point forward in college and can initiate the offense when asked to. However, his doubters have wondered whether Porter has much upside or if he has maxed out in terms of skill. It appears quite likely that the Wizards will grab Porter with the third pick and keep him in D.C.
Ben McLemore: The 6’5” red-shirt freshman is a top-of-the-chart athlete and possesses a natural jump-shot. He has a pure 2-guard’s build and at times exhibited shut-down defensive ability. McLemore averaged 16.4 ppg and shot better than 50% from the field. He’s been sliding a bit recently due to reports of poor workouts, but McLemore should go no later than pick 6. Victor Oladipo: The 6’4” Hoosier made a gigantic leap from his sophomore to junior years. Formerly known as a defensive stopper and elite athlete, he added to his offensive game this past season, averaging 13.6 ppg on an amazing 60% shooting from the field. Oladipo can now stroke the 3 and get easy buckets in transition and with drives to the rim. His on-court motor was unmatched in college, and he’s been compared to Dwyane Wade by Tom Crean, who coached both of them. Look for Oladipo to be off the board before pick 8. 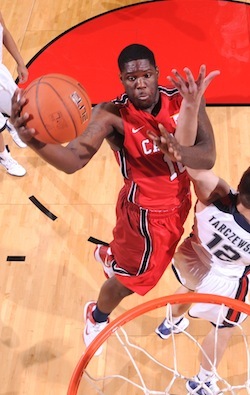 Anthony Bennett: The 6’7” strong-framed UNLV freshman is possibly the most versatile offensive player in this draft. He hits the offensive glass, can nail the 3, finish in the open court and post up with either hand. Bennett put up 15.8 ppg and 8 rpg in his lone collegiate season. On an experienced team, he quickly became their alpha baller. Some analysts believe that at the pro level he won’t have a true position, too small for the 4 and not really a wing 3. But Bennett’s mental toughness will be a definite asset at the next level. He’s a top-10 pick. C.J. McCollum: The 6’3” senior combo guard from Lehigh University participated in only 12 games last season due to a broken left foot. However, in those 12 contests McCollum averaged 24 ppg on 50% from the field and 51.6% from 3. He is the Patriot League’s all-time leading scorer, and has been on the pro radar for the last couple seasons. McCollum’s stock may be hurt because of the lower D-1 competition he faced. The rare senior in the draft, McCollum is a leader and player willing to assume whatever role his team requires. This unselfish and mature teammate should be off he board by pick 11. Trey Burke: The 6’1” sophomore Wolverine is considered by most to be the best PG prospect in the draft. The 2013 National Player of the Year led Michigan to the NCAA title game. He averaged 18.6 ppg and 6.6 apg as the floor leader of a talent-rich squad. Excellent in the pick and roll, with a deadly pull-up jump shot, Burke faced quality defenses focused on stopping him last year in the competitive Big 10. It’s worth mentioning that he stepped up in crunch time on several occasions last season. This very confident lead guard with a good sense for game flow should be gone by pick #9. Cody Zeller: The 7’ Indiana sophomore tested as the top athlete among big men at the combine. In the toughest conference in the country, he put up 16.5 ppg, 8.1 rpg and 1.3 bpg. Behind a complete offensive game, Zeller got to the free throw line 7.2 times per game this season. He runs the floor extremely well for a 7-footer and has tremendous balance and coordination around the low post. Zeller also possesses the proverbial high hoops IQ. Some teams have expressed worry about his short arms and small hands, but look for Zeller to be a top-12 pick. Michael Carter-Williams: The 6’6” sophomore PG from Syracuse may be the most controversial player among NBA scouts. There are those who think he’s the best point guard in the draft. They see the wonderful size he brings to the lead guard role, his 7.3 apg and 2.8 spg (both top-5 in the NCAA last year) and his leading the ‘Cuse to the Final Four. Others note his 44% shooting from the field and 29% from the 3 and the fact that he’s turnover prone. His doubters also don’t believe he can become a proficient enough scorer to keep defenses honest. Williams could go anywhere from 7 to 14. Ron Thompson, Steve Kerr, Vince Cellini & I break down the 2013 NBA Draft Monday 8PM ET on NBATV!